ROBERTA: A while back we welcomed former screenwriter and psychotherapist Dennis Palumbo to Jungle Red Writers to talk about the psychology of writing, writing blocks, and getting creative. When I realized his first novel, MIRROR IMAGE, had just been published, I had to know whether he'd faced some of the same issues he helps his clients--and how he handled them of course. And he graciously agreed to spill everything....I mean, er, join us for a discussion! 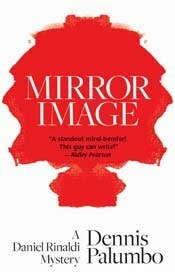 DENNIS: Okay, here's the good news, at least from my perspective: my first crime novel, Mirror Image, has just been published by Poisoned Pen Press. Moreover, a number of well-respected mystery writers have been gracious enough to say nice things about it. So much for the good stuff. I've counseled writers through the turmoil of early drafts, the terrors of manuscript submission, the perils of publication. I've helped them struggle with writer's block, procrastination and fear. I've consoled them in the face of an agent's neglect, a publisher's rejection, an editor's disrespect and an industry's indifference. I mean, let's face it: I know the drill. So how has it been for me, now just another author with a product hitting the marketplace? If anyone should be able to handle the expected pragmatic and emotional challenges, it's me. Right? Guess again. In the months leading up to Mirror Image's release, I have obsessed about the book's title; fantasized one minute about getting on the best-seller's list and then in the next was absolutely convinced that no one would buy it at all; yearned for my agent to be completely devoted to my personal and professional well-being to the exclusion of all else in his life; already mentally answered potential bad reviews with pithy, scathing rejoinders; and felt unloved and unappreciated when a friend even looked like he was anything less than totally thrilled or profoundly moved at the thought of my novel coming out. Believe me, I could go on, but space doesn't permit. The point is, despite the knowledge and insight gained from long-time careers as both a writer and a therapist, I found myself wrestling with the same dilemmas as every other author. Why? Because, like it or not, if you're a writer, there's no escaping the writer's life. As I've learned with the publication of this new novel, when it comes to the feelings, obsessions and just plain worries that accompany any writer's efforts, there's no "Get out of jail free" card. Even when, like me, you've already published a novel previously, as well as a collection of mystery short stories, and even a nonfiction book about---what else?---how to deal with the up's and down's of the writer's life! Which means that regardless of career experience, advancing age and sizeable amounts of therapy, there's no "cure" for the writer's life. As soon as a writer commits to the writing of a thing, he or she embarks on a journey through both an external world of crises and triumphs, and an internal world of feelings and belief systems. And this is true for all writers, no matter their level of success, no matter how large and loyal their readership. After many years in the literary trenches, on both sides of the battlefield, I can posit with great assurance two simple facts: first, that all successful writers used to be struggling writers; and, second, that the successful ones still struggle. This is not merely philosophical ruminating on my part. As my recent experience with Mirror Image attests, this is the straight dope. One of those hard truths of the creative life. Bedrock. On the other hand, I've negotiated the psychological rigors of publication about as well as can be expected. As both writer and therapist, I've learned---and changed---a lot over the years, and it's definitely made a difference. The biggest change? Probably this: In many ways, I'm as neurotic and insecure as I ever was. I just don't hassle myself about it anymore. And although that might not be a cure, it's the next best thing. Great post! Nice to know that even an expert is not immune to the stress of publishing. I've owned Writing from the Inside Out for years, think it's a great book, an often recommend it. Best of look with Mirror Image! So there's no cure, eh? I think it takes great courage for writers to put themselves out there asking for rejection, over and over again. We should congratulate ourselves (for being masochists?). Misery LOVES company... so nice to know we're all neurotic, if that's the right word for it. Congratulations on the book, Dennis! Kristan--you think you're a fake? I guess that's comforting to know, since your books are so much fun:). And JB, no one I know is immune. Even Dennis LOL. And yes Sheila, it really does take courage. Thank you, Dennis. I *LOVE* Writing from the Inside Out. You helped me through a very tough patch when my career was going well but inside I was wracked with self-doubt, wondering when everyone would figure out I was a fraud. Your books helped me see I was just on one of those plateaus with another higher one just ahead and I was afraid to make the leap across the chasm. I've still got those plateaus ahead of me but I'm no longer so afraid of them. Best of luck to you and your newest release! 1--you have no idea what's good or bad when it happens, so what you think might be the most terrible thing in the universe will turn out to be fantastic the next day. And 2--as a result of that, might as well have a positive outlook on everything! Right? Yes, easier said. But still. SO reassuring to remember we are not alone. Congratulations, Dennis.And thank you. First of all, thanks to all of you for your kind words about my post. Believe me, no matter how long a career a writer has, he or she still struggles with the same issues! Thanks, Kristan. Most writers I know feel they may be frauds, at least some of the time. As for those writers for whom all writing is smooth sailing...Let's just say I'm deeply suspicious! Thanks so much for the praise for my nonfiction book, "Writing From the Inside Out." I've always been gratified by the response that book gets. Glad you both have found it helpful. And, Roberta, you're right...no one's immune. Not even me. Which is why I wrote the post. Thanks for inviting me to do so! Wow Dennis, I don't know if I'm inspired or terrified. Does this mean the Buddhist philosophy I've turned to deal with "the writers life" isn't going to work?? Congrats on the new book. And except for my own personal fear element, this is a terrific post!! Congratulations Barbara on the publication of your novel. I hope to read it soon. Best of luck. I'm giving this post to the man I live with so he can understand my particular "crazy" is normal.